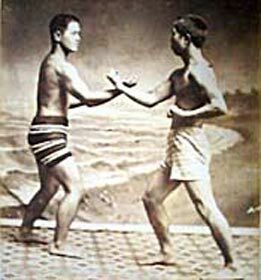 After two centuries of evolution Okinawan Toudi (the predecessor of karate) had developed into several distinct styles by the 19th Century. One of these styles, known as Naha-te, was dominated by Aragaki Seisho [1840-1918] and the Kojo family style in the early part of the 19th Century. However Naha-te of this lineage, which had historically close connections with China, lost much of its influence by the later half of the century (after Okinawa was annexed by Japan in 1872 and China lost the war with Japan in 1895) and had nearly become extinct by the end of the century. However, another lineage of Naha-te taught by Kanryo Higaonna Sensei began to assert itself after the 1890s. This resurgence can be attributed to Higaonna Kanryo Sensei’s sheer ability as a martial artist, which by the end of the 19th Century had assured him his place in history as one of the two most influential figures in the Okinawan martial-arts community (the other master being Itosu Anko). Kanryo Sensei’s Naha-te eventually became the dominant form of Naha-te in the earlier part of the 20th Century. 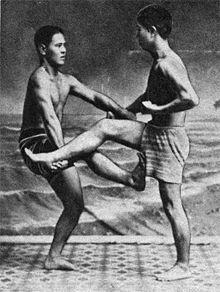 (Other styles of karate from other Naha-te tradition only became prominent in the later half of the 20th Century). The Naha-te which Kanryo Higaonna Sensei (1853-1915) taught forms the basis of Okinawan Goju Ryu Karate today. Kanryo Higaonna Sensei was born into a family belonging to the Chiku-udun Pēchin （a lower order of the nobility within the Ryukyu Kingdom). Whilst he was a teenager his father died during an altercation, the incident greatly affected Kanryo Sensei, and increased his desire to learn the martial-arts. Though he longed to study the art of Chinese Kenpo (boxing), he lacked the means to do so until he approached his late father’s acquaintance, Yoshimura Chomei (1830-1898). Yoshimura Chomei was an “Aji” or aristocrat belonging to the Udun (Royal House). Being from a branch of the royal family and also a wealthy ship owner, Yoshimura had the influence to secure Higaonna’s travel permits. Yoshimura also granted him free passage on one of Yoshimura’s ships sailing to China. Kanryo Higaonna Sensei arrived at the port city of Foochow in China where after searching about for a suitable teacher he was eventually introduced to Master Ryu Ryuko (ルールーコウ). Kanryo Higaonna Sensei spent sixteen years in Foochow studying diligently under Master Ryu Ryuko. He attained mastery of Ryu RyuKo’s style of Kenpo and enjoyed considerable fame throughout the region as a martial artist. In Foochow his nickname was “Ka-Gin Kah Toon’na” which literally meant “Swift (Ka-Gin) Legs (Kah) Higaonna (Toon’na). Upon his return to Okinawa, Kanryo Higaonna Sensei repaid Yoshimura Chomei’s patronage by teaching the martial-arts to his sons who were also members of the Ryukyu royal family. As the word spread of Kanryo Higaonna Sensei’s skill and prowess, the number of his students increased. However prior to 1901 when Toudi (karate) was allowed to be taught openly in schools, Kanryo Sensei only accepted private students with recommendations from people he knew and whom he considered to be worthy in terms of the person’s potential and character. 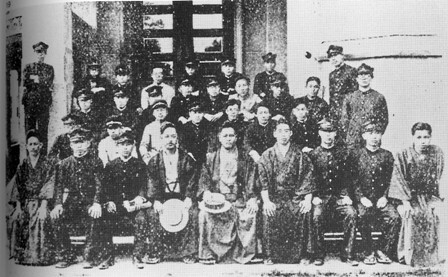 In 1905 Kanryo Sensei began to teach Naha-te openly in schools. Kanryo Sensei’s dojo had trained an entire generation of later-day karate pioneers and masters who in turn helped shape Karate into what it is today. The founder of the Goju Ryu karate system was Miyagi Chojun Sensei (1888-1953). Miyagi Chojun Sensei was born into a wealthy family of Shizoku descent (although by the year he was born the Shizoku system had been abolished for a decade). Miyagi Chojun Sensei was the foremost student from amongst Kanryo Higaonna Sensei’s inner circle of disciples, being the most able of his students in terms of ability and having spent the longest period of time training under Kanryo Sensei. Miyagi Chojun Sensei first learnt Toudi (Karate) at the age of 11 from his neighbour, the Tomari-te exponent, Aragaki Ryuko (1875-1961). Because he showed exceptional promise, Aragaki Ryuko introduced Miyagi Chojun Sensei to Higaonna Kanryo Sensei when Chojun Sensei was 14 years old. Miyagi Chojun Sensei spent thirteen years learning Naha-te from Kanryo Higaonna Sensei until the later passed away in October 1915 after officially naming Chojun Sensei as his successor. As Miyagi Chojun Sensei’s family owned trading ships that imported herbal medicine from China, he had the means to leave for China to discover the roots of Naha-te in the city of Foochow prior to and after the death of his teacher (In October 1915). He traveled with Eisho Nakamoto (1881-1945) to Foochow in May 1915 and again, in 1917 he traveled with Go-Kenki (1852 – 1940) once more to China. His travels were partly in search of Ryu Ryuko’s students, and partly to research Chinese Kenpo. Unfortunately, most of the martial artists from Kanryo Higaonna Sensei’s generation had died or fled China during the revolutionary war. His entourage visited Ryu Ryuko’s grave and his abandoned training place before returning to Okinawa in the first trip in 1915. In the 1917 trip to Foochow Chojun Sensei researched the Chinese kata known as Rokkishu, which he later modified and adapted into his system as the “Tensho” Kata in around 1918. Thereafter, as the new chief-representative of Naha-te, Miyagi Chojun Sensei continued to train with great intensity, and he developed and refined the system he inherited. One of those early developments was a comprehensive set of exercises known as Junbi Undo (Preparation Exercises), which was first conceived and introduced into Chojun Sensei’s curriculum in around 1918. Prior to that time, Toudi (Karate) training in general did not include warm-up or preparatory exercises. In addition to his personal training and development of Naha-te, Miyagi Chojun Sensei spent a great deal of his time and resources on promoting the art. In 1918 he worked with Choki Motobu, Kenwa Mabuni and Chomo Hanashiro to form the Ryukyu Toudi Kenkyu Kai (The Ryukyu Chinese-Hand Research Association). This organisation was created as a platform to exchange information on concepts, techniques and training methods amongst different styles and its members eventually included many of founder-masters of other karate Ryus/schools. 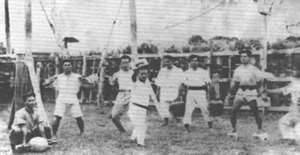 On 6th of March 1921, the Okinawan Department of Education (沖縄文部署) invited Chojun Sensei to perform a demonstration of Naha-te for the visiting Prince Hirohito (later the Emperor of Japan) and the actual demonstration took place on the 10th of March 1921. In 1925 Chojun Sensei demonstrated Naha-te again for visiting Prince Chichibu. Miyagi Chojun Sensei had already envisioned the development of Naha-te not only in Japan but also around the world. It became increasingly important to organize and unify Okinawan Toudi (karate) as a cultural treasure to be passed on to future generations. In 1926, Miyagi Chojun Sensei once again co-operated with the same three karate pioneers to establish the Toudi Research Club in Wakas-Cho, Naha. The four instructors, Miyagi Chojun, Chomo Hanashiro, Choki Motobu and Kenwa Mabuni, taught alternately some preliminary exercises and supplementry exercises and basic techniques to karate enthusiasts. In 1927, Kano Jigoro Sensei, the founder of Judo, saw a demonstration of Naha-te by Miyagi Chojun Sensei and was impressed by the technical sophistication of Naha-te. Using his influence Kano Jigoro arranged for Miyagi Chojun Sensei to perform Okinawan Naha-te at leading Japanese Budo tournaments sponsored by the government. The most significant demonstrations performed by Miyagi Chojun Sensei were those at the Dai Nippon Butoku-kai (Greater Japan Martial Virtue Association) Tournament in 1930 and at the Sainei Budo Gathering in 1932. As its exposure increased, many became interested in Miyagi Chojun Sensei’s art. In 1930 one of Miyagi Chojun Sense’s senior disciples, Shinzato Jinan Sensei, gave a demonstration at a Japanese martial arts tournament (Tokyo Meiji Shrine Budo Tournament 東京明治神宮武道大会). Afterwards he was asked the name of his school but Shinzato Sensei had no answer. He returned to Okinawa and told Miyagi Chojun Sensei about his encounter. Chojun Sensei realised that in order for Naha-te to be accepted by the Japanese Martial Arts establishment, it was necessary to name his art. Sometime between 1930 and 1933, Miyagi Chojun Sensei began to name his art “Goju Ryu Toudi”, meaning the “hard and soft style Chinese Hand”, having taken the name “Goju” from a phrase in the martial arts manual, the “Bubishi”. He was the first among different schools of karate to give a name to his art and other schools soon followed. After much lobbying and their ceaseless efforts to promote karate in Japan, Miyagi Chojun Sensei and his contemporaries achieved a breakthrough in 1933 when they finally persuaded the governing Japanese Martial Arts organization, the Dai-Nippon ButokuKai to recognize Toudi (Karate) as a Japanese Martial Art, and in recognition of Chojun Sensei’s leadership, Goju-Ryu became the first Okinawan Toudi(Karate) Style to be formally registered with the Butokukai in 1933 . This was a significant development as it allowed Toudi (karate) to be legally taught in Japan henceforth. 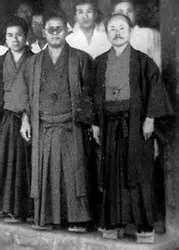 In 1933 Miyagi Chojun Sensei also became the first permanent director of the Okinawan Branch of the Dai Nippon Butokukai. In the following years, Miyagi Chojun Sensei worked through the Dai Nippon Butokukai to promote Goju-Ryu Toudi(karate) in Japan. By 1936, Toudi was formally re-named “Karate” under the direction of the Dai-Nippon Butoku-Kai in order to rid the art of any implication that it was connected to China, despite the protest from some of the masters in Okinawa. 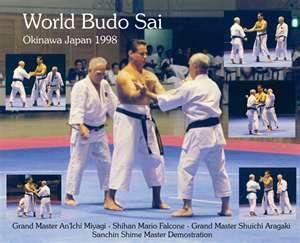 Apart from Japan, Miyagi Chojun Sensei also traveled overseas to promote karate as well as study other martial arts. In 1934 he went to Hawaii to promote karate where he encountered and decided to incorporate the Kongo-ken, a Hawaiian training aide, into the Goju-Ryu system. In 1936 he traveled to Shanghai to further study Chinese Martial Arts. In 1937, Chojun Miyagi Sensei (宮城長順), Yasuhiro Konishi Sensei (小西康裕) and Sannosuke Uejima Sensei (上鳩三之助) became the first karate pioneers to be awarded the “Kyoshi” （Master Teacher） title within the Dai-Nippon Butokukai. This was the highest rank any karate practitioner had ever attained within the Japanese Martial Arts establishment, and it marked the rising status of karate within the Japanese Martial Arts Establishment. By this time Goju-Ryu karate had spread in Japan through the education system. 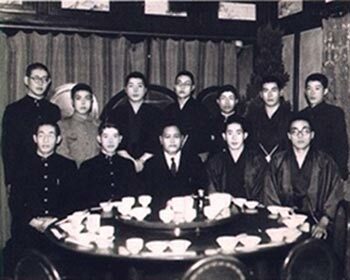 Chojun Sensei’s early student Jitsuei Yogi (who had studied with Chojun Sensei in 1929), had set up a karate club in the Ritsumeikan University with a core group of students such as Yamaguchi Gogen and Cho Nei Sho. 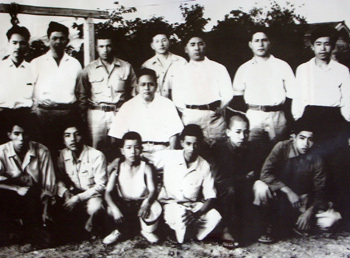 This group of students eventually formed the nucleus of the organization known as the Goju-Kai after the Second World War. Chojun Sensei had personally taught this group of students for several months but had entrusted their training to other visiting senior students. In Okinawa, Chojun Sensei had often entrusted the propagation of Goju-Ryu to his most senior student Jinan Shinzato. Shinzato Sensei was the stand-in instructor for Chojun Sensei in his absence (which was very often) and also represented Chojun Sensei in many Budo events. But apart from his own dojo which was taken care of by Jinan Sensei, Chojun Sensei had also given his blessings to Seiko Kina Sensei to teach karate under the Goju-Ryu Banner. Seiko Kina’s dojo was named JunKoKan (順興館), where Jun was part of Chojun Sensei’s name and Ko was part of Seiko Sensei’s name. When Junkokan was first established, Chojun Sensei gifted a pair of Nigiri-game jars to Seiko Kina Sensei as a sign of approval (one jar remains today with the ZKA-Kobukan, passed down through Uehara-Ko Sensei to Sensei Lam). In 1938 Miyagi Chojun Sensei was appointed as a Karatedo instructor at Okinawa Teacher Training School. In 1940 Miyagi Chojun Sensei was approached by the governor of Okinawa to create the beginner’s kata “Gekisai-dai-ichi”. He later added a second kata Gekisai-Dai-Ni to the Goju-Ryu system. These kata now form an important part of Goju-Ryu’s syllabus. A tragic period ensued in the 1940’s as a result of World War II and Miyagi Chojun Sensei stopped teaching. During this period he lost a son, two daughters and his most senior student, Shinzato Sensei. Like everyone else, Chojun Sensei also had to endure the devastations of war and poverty. After the war, Goju-Ryu karate spread rapidly throughout mainland Japan through the Goju-Kai. Miyagi Chojun Sensei taught karate in Kansai, Japan, for a short time but in 1946 Miyagi Chojun Sensei returned to Naha and began teaching at the Naha Police Academy. By this time Miyagi Chojun Sensei had begun to re-organize his Goju-Ryu syllabus. Whereas previously he had taught a system of 4 Kaishu kata to each student in a period of about 5 years, and reserving the full syllabus of 8 Kaishu kata for only the most senior students who had been training with him continuously for more than a decade, after the war he began to teach 8 Kaishu kata in conjunction with Sanchin and Tensho within a period of 4 years. He also re-organized his training methods. Prior to 1951 Miyagi Chojun Sensei only taught 2 private students (Miyagi An’ichi and Aragaki Shuichi) and they were amongst the first students to be exposed to his new system. 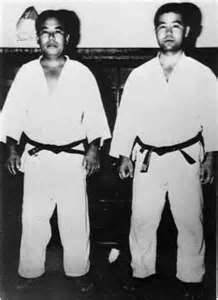 At the same time Chojun Sensei had continued to teach in the Police Academy, even though he taught a different syllabus to private students as opposed to students in the schools and police academy, partly because each group of students had worked on a different time-table and focused on different aspects of karate. In 1951 Miyagi Sensei began accepting a few students again at his garden Dojo. Two years later on 8th October 1953, Chojun Sensei passed away. Chojun Sensei teaching Goju-Ryu karate in Naha before the war. 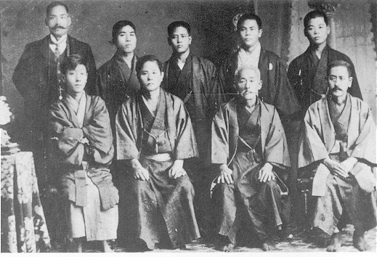 Chojun Sensei with his students from the Post-War era，Anichi Miyagi Sensei was standing in the back row, third from the left. Pre-war Goju-Ryu students demonstrate Goju-Ryu training. Miyagi Chojun Sensei devoted his entire life to the study, development and transmission of Okinawan karate as he recognized karate as a valuable social and cultural treasure of Okinawa and realized the importance of preserving the art for future generations. Although he was from a wealthy family background he used all his time and family resources on karate. As a director of the Okinawan Branch of the Japanese Martial Arts Association in the Pre-War era, he was instrumental in preserving Okinawan karate as we know it today. Elected as a local government representative in the post-war re-construction period due to his popularity and good character, he nonetheless resigned the post to devote himself to karate. Miyagi Chojun Sensei is recognized throughout the world as one of karate’s greatest pioneers. After Miyagi Chojun Sensei’s death in 1953, his students continued to teach his Goju-Ryu system at first in Chojun Sensei’s garden dojo. In 1957 training was moved to the newly established Jundokan. One of Chojun Sensei’s students from before the war, Miyazato Eiichi Sensei, was the founder of Jundokan and many of Chojun Sensei’s students in Okinawa agreed to train under one dojo. Senior students such as Seiko Kina Sensei (Founder of Junkokan) , Iha Koshin Sensei and An’ichi Miyagi Sensei initially acted as advisors, administrators, and sempai instructors, of the Jundokan. Other students of Chojun Sensei eventually managed to formed their own organisations to teach their own lineage of Goju-Ryu karate (such as the Meibukan set-up by Meitoku Yagi Sensei). On the Japanese mainland, the Goju-Kai formed by Jitsuei Yogi and Yamaguchi Gogen, and its splinter organisations subsequently became very successful in promoting karate to the world. By the 1960s Goju-Ryu Karate had spread throughout the world under these various organizations and it had become one of the main styles of karate practiced throughout the world. One of the most renowned Goju-Ryu dojo include Morio Higaonna Sensei’s Yoyogi Dojo (at that time a member dojo of the Jundokan) in Tokyo, Japan, which trained many international students coming from all parts of the world. In 1979, Morio Higaonna Sensei formed the IOGKF (International Okinawan Gojuryu Karatedo Federation) in the United Kingdom with senior Goju-Ryu Masters such as Jitsuei Yogi Sensei, Seiko Kina Sensei, Anichi Miyagi Sensei, Aragaki Shuichi Sensei, Seijin Nakamoto Sensei, Kiei Tomoyose Sensei and Shunshin Furugen Sensei as IOGKF’s senior technical advisors. Many other world renowned karate yudansha (Black-Belt Holders) also joined the IOGKF because of the calibre of its senior members. Following the footsteps of other karate organizations, the IOGKF began to promote Goju-Ryu karate in many parts of the world. In a few short years the IOGKF had become very well-established and recognized as one of the most influential Goju-Ryu Karate organizations in the world and Morio Higaonna Sensei as one of the foremost karate masters of his generation. From 1982 onwards Morio Higaonna Sensei had been liaising with the Fuzhou Martial Arts Association through his Representative in China, Sensei Lam King Fung, in order to discover more about the origins of Goju-Ryu and the life and times of Higaonna Kanryo Sensei whilst he was learning from Ryu Ryuko in China. BY 1987, Morio Higaonna Sensei was able to lead a historic delegation to Fuzhou of China (Foochow, in the Fujian/Fukien Province). It was the first official visit by any Okinawan Goju-Ryu Karate delegation to China since 1936 when Chojun Miyagi last came, and the Fuzhou City Government, the Fujian Province Martial Arts Association as well as the Fuzhou City Martial Arts Association jointly played host to the delegation. This historic visit paved the way for many more fruitful exchanges between the two regions over the next few decades. In late 1997 and early 1998, Morio Higaonna Sensei and Okinawa Goju-Ryu Karate Bujutsu (Bujutsu is the Japanese term for Martial Art) were formally recognized and inducted into the Nihon Kobudo Kyokai, the head department of the Nihon Budokan, headquartered in Tokyo, Japan. This is an important milestone for the history of Goju-Ryu and for karate because of the importance of the role this organisation plays in Japanese martial arts culture (the kanji translation of the word “Kobudo” in this context represents “old martial arts”). This organisation recognizes and preserves original and traditional Japanese martial arts and boasts the fact that many of their members have been declared “National Cultural Treasures” by the Japanese government. It is considered a great honour in Japan to be recognized by this organisation. As their mission is to ensure that only the most eminent and recognized styles which have a clear lineage traceable to the founder of their Ryu (Style) are admitted, it is very difficult for most martial-arts styles to win recognition and many have been refused admission. 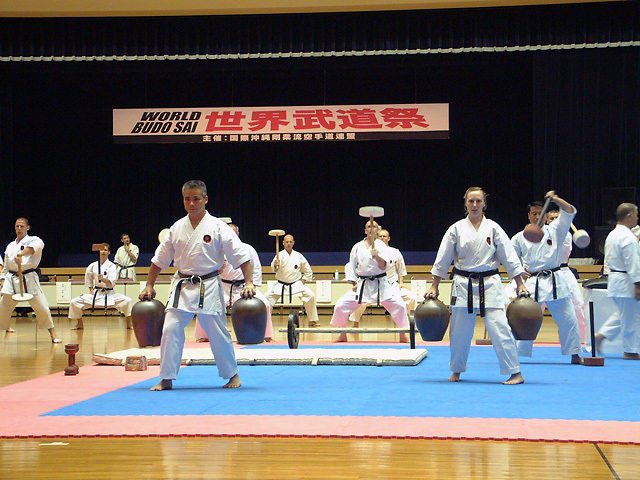 Currently, member styles include Ju-jutsu, Ken-jutsu, Aiki-jutsu, Taiho-jutsu, Ryu-kyu Kobu-jutsu, and Okinawan Goju-Ryu Karate-Do Bu-jutsu represented by Morio Higaonna Sensei and the IOGKF. Once a year the Nihon Budokan stages a televised documentary showcasing each member style. Okinawan Goju-Ryu Karate-Do first participated in this event in early 1998, and has continued to do so every year since then. Anichi Miyagi Sensei and Morio Higaonna Sensei Hanshi Anichi Miyagi and Hansi Aragaki Shuichi performing Shime during an IOGKF World Budosai Event IOGKF demonstrates Goju-Ryu training methods. IOGKF Hanshi Morio Higaonna Sensei demonstrates a Goju-Ryu technique. The heart and mind should be one with heaven and earth. The body must adapt at all times to all changes. The hands should exploit all openings. The feet should close or separate distance without conscious thought. The eyes should observe four aspects.